Includes a wide range of Pennsylvania towns near Philadelphia including: Allentown, Ambler, Berwyn, Bryn Mawr, Camden, Chester, Coatesville, Collegeville, Conshohocken, Devon, Dover, Downington, Doylestown, Georgetown, Gloucester, Germantown, Hatboro, Hatfield, Lansdale, Lansdowne, Malvern, Newtown, Norristown, Pottstown, Souderton, Swarthmore, Tioga, Trenton, West Chester, Wyoming plus, many, many more locations. 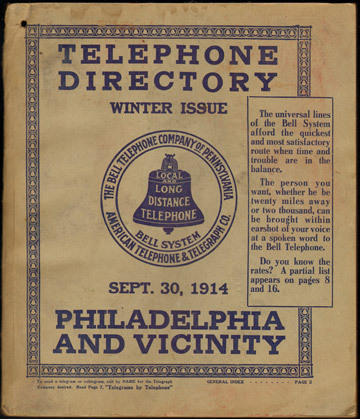 367 pages of Philadelphia telephone listings in triple columns plus 231 pages of triple column telephone listings for outside of Philadelphia. A total of 600 of pages with tens of thousands of telephone listings from across the region. Large format directory pages measure 9.5 x 11". Cover soiled, first ad page stained. Inside pages are clean with light age toning.